Climate change has been a hot topic in recent years, growing hotter with the 2007 Nobel Peace Prize going jointly to former US president Al Gore for his cautionary film, An Inconvenient Truth, and to the Intergovernmental Panel on Climate Change (IPCC), a child of the UN, for their efforts to publicize and investigate the foreboding subject. 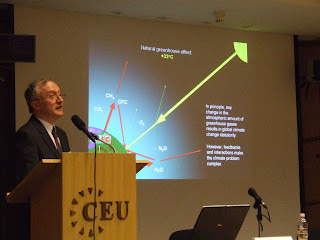 The Energy Source was in attendance at Budapest’s Central European University (CEU) this past Thursday and Friday as IPCC scientists along with local academics, corporate dons and government officials talked up the subject for the general public at an outreach event while the official 28th session of the IPCC met across the river at the Congress Center. The upshot of some 18 hours of presentations and panel discussions was expected: we have corrupted the very climate that governs life on Earth. Less expected was the scale of pessimism that emerged: the problem worsens by the day and despite experts’ efforts to prescribe urgently needed remedies, things are likely to get much worse before they have a chance of getting better. As the climate changes, so change ecosystems, meaning vast disturbance not simply to the creatures of the land and sea, but to agriculture and human economy. A steady rise in GHG emissions in Hungary over the last three decades was the presentation topic of Dr. Laszlo Haszpra of the Hungarian Meteorological Service (HMS). Haszpra explained that so far approximately half of global GHG emissions have remained in the atmosphere while the oceans and surface soil and plant life have absorbed the other half. “But we are quickly reaching a limit,” he warned, “soil will become saturated and emit more CO2 than plants can absorb.” At which moment, he explained, the Earth’s soil will cease to be a carbon sink and become a carbon source, joining forces with the industries, motor vehicles and animals than line its surface. His HMS colleague Dr. Janos Mika correlated the rise in emissions to ominous changes in leading climate change indicators: average temperature, temperature variability, tropospheric warming, diminishing snow cover and glacial and sea ice melting. Mika gave 90% of the credit for a 50-year trend of global warming to rising GHG emissions. Professor Istvan Lang of the Hungarian Academy of Sciences described how such climate change could soon reverse seasonal rainfall patterns, thereby forcing radical change to crop production. The price and availability of food would likewise be affected. No one at the conference suggested such radical alterations to human habits as swapping personal motorcars for bicycles, or a sweeping switch to a vegetarian diet; both of which would directly reduce GHG emission. Rather, technology-based solutions were emphasized. Economics and Transport Minister Csaba Kakosy talked up the need for nuclear power and a HUF 400m increase to Hungary’s renewable energy fund. Carbon capture and storage (CCS) – or pumping COx gases underground - was advocated both by Professor Sims and economist Dr. Laszlo Varo of MOL, both of whom kept their optimism well guarded. It was comments by Dr. Varo, however, that revealed the most about how the looming climate crisis came in to being and why it will be difficult to resolve. 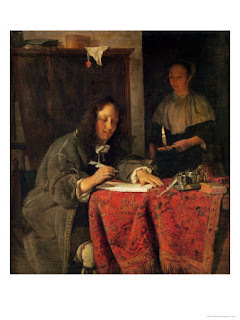 What should you do if you want to write? First, commit yourself to starting a blog. But before you start it, think about what sort of theme you want convey. Check out some other blogs. www.technorati.com is the best blog search engine I've found. Enter in key words that speak to you and find out what blogs are running on those themes. This blog should not be just a personal online diary, but a showcase of your writing talent, your insight, your curiosity. Once you have a design you like, show it to some other people (I'm happy to look at it). A good theme reflected in both the design and the writing is a requirement of a good blog that will go places. The next requirement is to update your blog regularly. Give yourself a weekly deadline. If your blog is regularly updated, you have the best chance of having regular readers. Of course you need to be sure that your entries are substantial and interesting to read and line up with you theme. The next step is to circulate your blog. Put the URL on your email signature, your business cards, your facebook page, etc. Let the world know "I am a writer! Here's where you can read my writing!" You may also want to find out what "collaborative" blogs are out there. One that is devoted to travel could be useful, especially if its widely read, maybe affiliated with Lonely Planet or something similar. Parallel to developing your blog, find places to get published. Find out about all the publications that are based near where you live that are even remotely interesting to you. Also search among the people you know and find out who among them has anything to do with local publications or who knows anyone who does. Use Craigslist. Set up face-to-face meetings with the editors of these publications. Tell them you want to write and that you'd like a shot at freelance. This could be daily newspapers, weekly alternative papers, music mags, culture mags, etc. The trick is to get started writing and getting published. You'll most likely need a job (part-time, if possible) to make ends meet while you build up your dossier. You may wish to explore more than one "beat." I suggest both culture and real estate. These are best for travel. On your trip to SE Asia, you could research the local opportunities for real estate investment by day and check out the restaurant and nightspots in the evenings. As far as getting free trips, you'll probably need to get a bit established. But it may not take long. One way to get free trips is to write for in-flight magazines. Find out what these magazines are and how you can contact them. The best is just to find out who the editor is and give them a call. But have at least your blog in operation first and - ideally - have a few pieces published already, if only in some local minor publications. This will give you some clout. "Yeah, I'd like to have a shot at travel writing. I've travelled a bit and written about it. I've also had a few pieces published." As for getting free meals and places to stay: for this you need a place where you be published that will reach the audience of their potential customers. A collaborative blog devoted to travel and affiliated with a major travel guide could be all it takes. Your own blog could be used, if its well developed. One thing you could try is to start your own collaborative blog devoted to travel and scare up contributors from Facebook (find people interested in both travel and writing who themselves are either travelling now or have plans to travel soon) Make yourself the editor so you can maintain the level of quality. In other words, don't give them the password. Just have them email you the pieces. Let them know that once you get traffic and sponsors, etc., you'll share the revenues but for now this is just a place to get your voices heard. Once this blog has some decent travel content and a grabby URL, you can pitch it to hotels, restaurants, even airlines and/or travel agents and so forth before you begin you travels. Let them know you will review their gigs on your blog that get a gezillion hits daily by just the sort of customers they want and need. Moreover, you can tell them that whenever someone does a search on their venue, your review will pop up. So they should give you a free bed/meal/flight, etc. But we can cover these details once you've got your blog up and running. If you want to be an independent writer, one thing you do NOT want to do is to take a job in an office that demands your time and your brain for 8+ hours a day. Take a job in a hip diner or a bar or a bookshop or a cafe - someplace that tips! And then use the rest of your time WELL. Make contacts with other independent writers both in your area and online, preferably both. It is important to have a peer group with similar priorities to you. From them you can learn, get inspired and even compete. It can also be very useful to map out your time and set milestones, deadlines; a timeframe. By such and such a date I will have my blog launched in a groovy and professional way. By such and such date I will have met with 10 editors, etc.